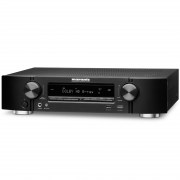 The Marantz NR1504 5.1-Channel Slim Network AV Receiver offers powerful multi-channel sound from a compact design. This receiver houses a discrete 5-channel amplifier that can deliver 50W per channel at 8 ohms. 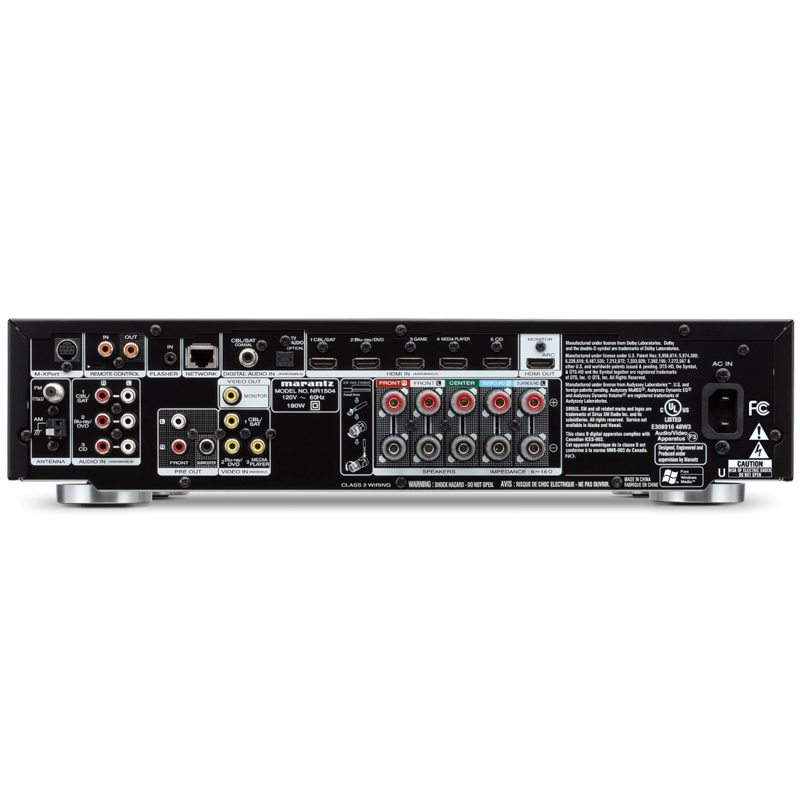 Audyssey calibration is built into the receiver to help you tailor the sound of the receiver and connected speakers to your listening environment; a setup microphone is included. Integrated AirPlay allows you to wirelessly stream audio from compatible devices such as iPhones and iPads. An Ethernet port is also available for wired high-speed connections. Internet connectivity allows you to access Internet streaming services, such as Pandora and Spotify. The Marantz NR1504 is sized just right to fit comfortably on just about any bookshelf or TV stand. 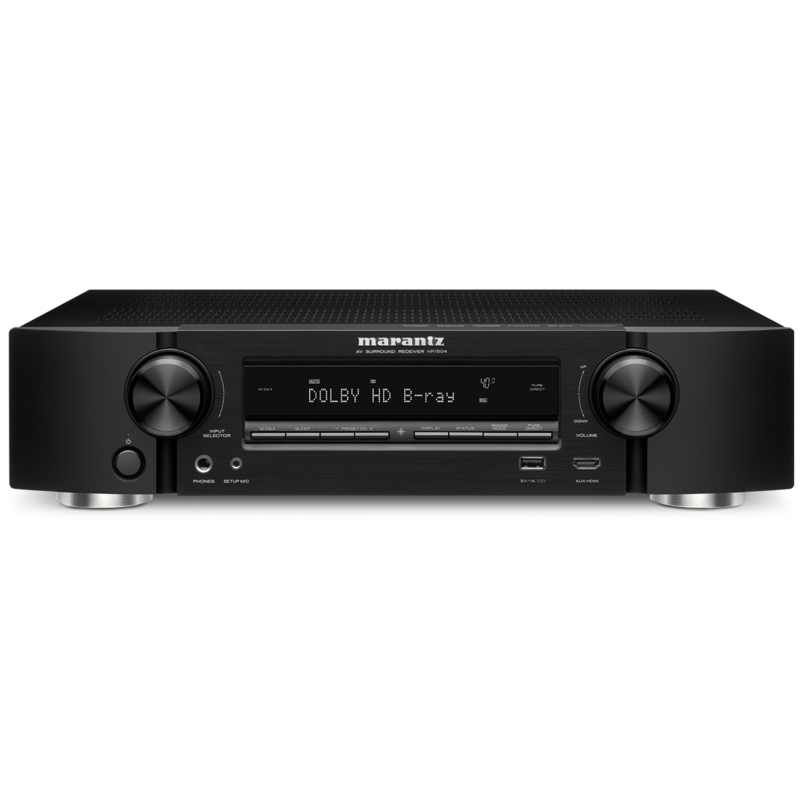 This full-featured model measures only half the height of many surround sound receivers, yet it boasts all the clean power you need to drive five speakers, and enough inputs to connect a full complement of A/V sources. 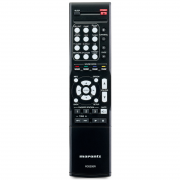 Plus, the ‘1504 sports built-in Apple AirPlay® and a host of online entertainment options. Apple’s easy-to-use AirPlay technology lets you access your favorite music from your iPhone®, iPad®, or iPod touch®, or from your iTunes library on your computer. You’ll be able to control playback and see music information — including album art, track titles, and artist info — on your compatible Apple device, or on your TV. AirPlay requires a wireless home network and a wired connection between the receiver and the network. Your listening options aren’t limited to the songs in your music library, either. The NR1504 lets you choose from thousands of free Internet radio stations or explore online subscription services like SiriusXM, Pandora, and Spotify. This receiver even streams photos from your PC or online from Flickr, so you can view your favorite photos on your HDTV’s large screen. Download a free app, and your iOS or Android™ device becomes a convenient Wi-Fi remote. 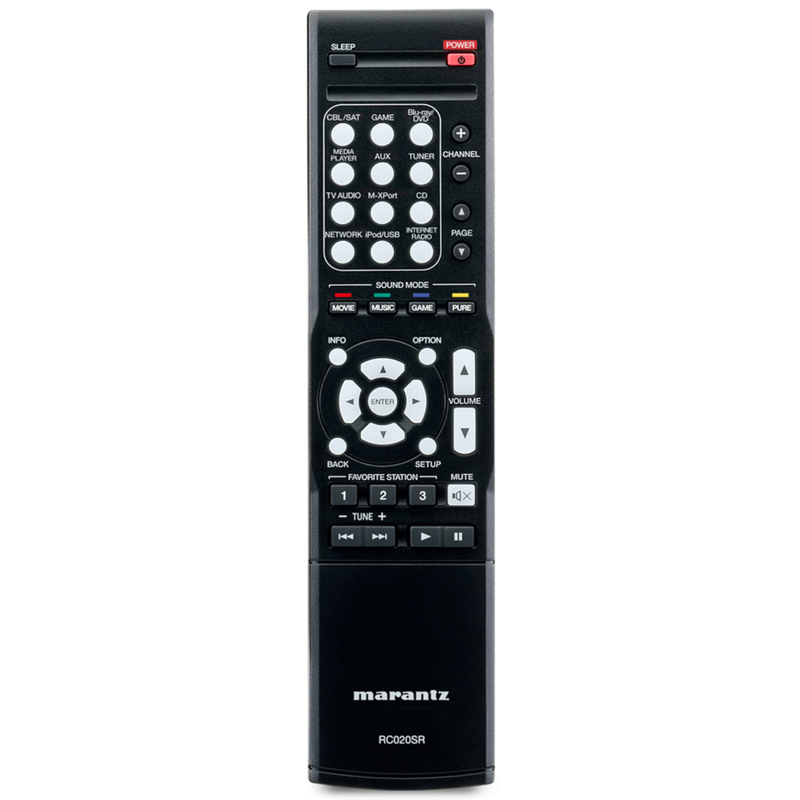 You’ll enjoy the intuitive, easy-to-read interface — plus that’s one remote that’s not likely to get lost in the sofa cushions. V shows, and video games. And cutting edge decoding delivers the master-quality sound that comes with most of today’s Blu-ray discs. The Marantz NR1504 has an on-board setup assistant to help you make all the right connections for your system. 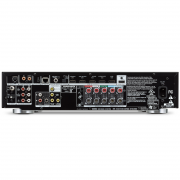 The supplied setup microphone allows this receiver to analyze sound from different listening positions, while you sit back as the receiver automatically adjusts level, equalization, and delay settings for each of your speakers. The result is accurate response across a wide listening area instead of just a single “sweet spot,” so everyone in the room can enjoy precisely balanced home theater sound.